Here’s another Throwback Thursday post! I went to Seattle with four college buddies for 5 days in October 2013. On one of the 5 days, we toured around Pike Place Market and stopped by the famous Pike Place Chowder. We ended up arriving a couple minutes before closing, so they had run out of bread bowls. Luckily, they still had plenty of chowders left! I got the smoked salmon chowder, which had the description “authentic Pacific Northwest flavors, with Nova smoked salmon, capers, and cream cheese. A Seattle favorite!” I was also given oyster crackers and a piece of sourdough bread. On my way out, there was a bowl of Andes mint up for grabs! A quick search for “clam chowder” on the internet found over 7 named variations: New England, Rhode Island, New Jersey (they add asparagus and sliced tomatoes?! ), Delaware, Hatteras and Minorcan (from St. Augustine, Florida), and a long list of variations, including a chowder from Portland and Seattle that includes smoked salmon instead of pork. 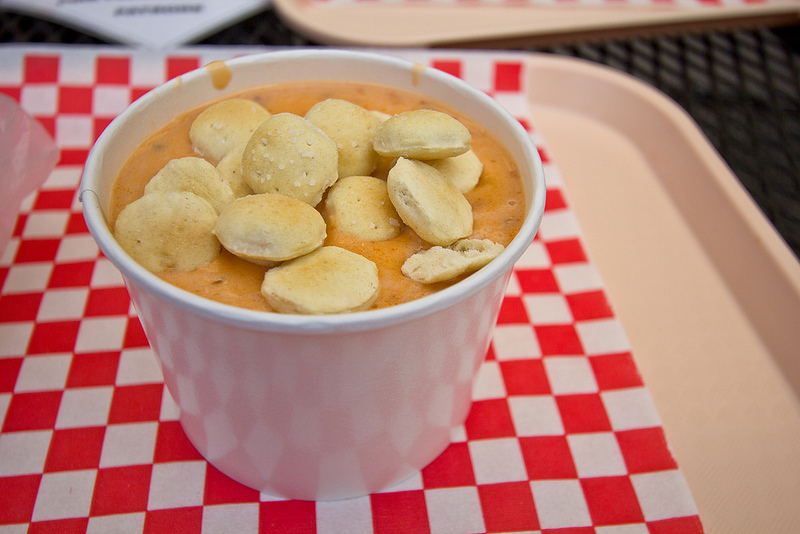 Some restaurants also serve their own unique clam chowders that do not fall into any specific categories. Clam chowder is usually served with saltine crackers or small, hexagonal oyster crackers. Throughout the United States, “New England-style” clam chowder is often characterized as being thicker and more creamy, even though traditionally it is rather thin (with many late 19th and early 20th century recipes using condensed milk as the base). This is sometimes served in sourdough bread bowls, especially in San Francisco, where sourdough bread is popular with tourists and has been considered a signature dish since 1849. In Seattle and Portland, smoked salmon is often added to New England style chowder instead of smoked pork. that sounds very delicious! i would need to try this some day. wonder if can get in the bay area? that’s a tough question to answer, as it’s most likely hard to find here. there’s plenty of recipes online, though!